Casey has the Journey Gym, and me? I have my own will power and commitment as a way to help me get in shape this year. So when Musselman's Applesauce introduced me to their "Replacement Resolution" I was intrigued. I thought, "What the heck, I can replace a snack a day with an applesauce" and you know what? It's working! I changed nothing about my diet, except I am no longer eating my granola bar as a mid morning snack. Instead I am eating one applesauce cup. I am feeling better, and looking better and plan to keep it up for the rest of the year! I also found out you can cut oil out of your baking by replacing it with applesauce! How cool is that! Here is a good conversion chart. Basically you use EXACTLY a 1:1 ratio. I am also really excited to try this Applesauce Doughnut recipe with the kids, they are baked not fried!! Slice doughnuts in half horizontally. Combine apple sauce, brown sugar, cinnamon and pecans. Place some apple sauce mixture between halves and arrange in shallow pan. Fill center and partly cover top of each doughnut with remaining apple sauce mixture. Bake at 375 degrees for 25 minutes. Serve warm. 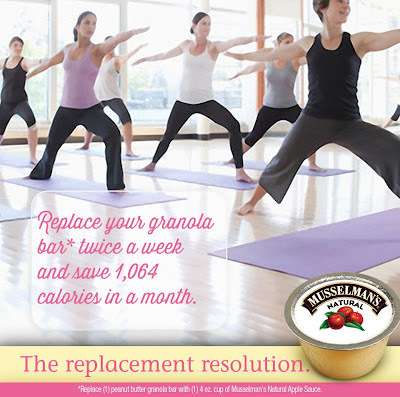 Want to win your own gift pack of Musselman's Applesauce and Yoga Ball to help with your replacement resolution? Enter using the rafflecopter form below for a chance! the candy I tend to eat. I would replace the oil in my homemade blueberry muffins with Musselman's applesauce! I would replace the oil in my brownies. I'd replace the oil in my banana bread recipe! I'd replace my afternoon cheesestick. I would replace some of the popcorn I eat. My afternoon bag of M&M's. Less cookies and cakes and more applesauce. I would replace my mid-morning chips! Chips. I love chips of any kind. Potato chips. Corn chips, etc. It would replace Tootsie Rolls.